Displayed across the third and fourth floor galleries of Annely Juda, this major exhibition of Leon Kossoff’s London Landscapes is a rare chance to witness the mechanics of a master’s mind. There are some 104 works in this show. From Railway Bridge Mornington Crescent 1952 to Arnold Circus, Saturday Afternoon 2012, most of these works are drawings; whether they are gouache on paper, charcoal, charcoal and pastel, charcoal and ink, ink and pen, or pen and crayon. However, there are ten paintings, oil on board, that have the dense, rough, thickly gouged surface that I came here hoping to view. In most cases, each of these paintings is surrounded by related drawings, which serve to describe the process from on-site sketch to finished work. The painting Children’s Swimming Pool, Autumn 1972 is flanked on both sides by four drawings of the subject; two from 1969 (one charcoal, one pen and ink) and two from 1972 (both pen and crayon). In this case, sketch becomes drawing; drawing becomes painting. Here we can see how the idea has developed over the course of the three years from the first sketch to the completed work. The painting is alive with yellows and blues, less muddy than his usual earthy, grey city palette. It is abundant with tiny bodies crashing through the water, hurtling into the pool, one figure holding their knees up close, shivering whilst watching from the poolside, another in the foreground stands apprehensively at the edge. This is a tender painting. This is life going on. It is also a moment in time well passed; a moment most of us can relate to, as a child in a draughty, local baths. And then, we realise just how much has changed around us. On the adjoining wall space, I come across three haunting charcoal drawings, each titled Midland Hotel Staircase 2005. Here, Kossoff captures the beauty of the derelict, before the monumental face-lift of the Midland Hotel. The result is truly breathtaking; there is ease in the gesture, and a thorough understanding of construction. The line is graceful, the movement so elegant, so sensitive. 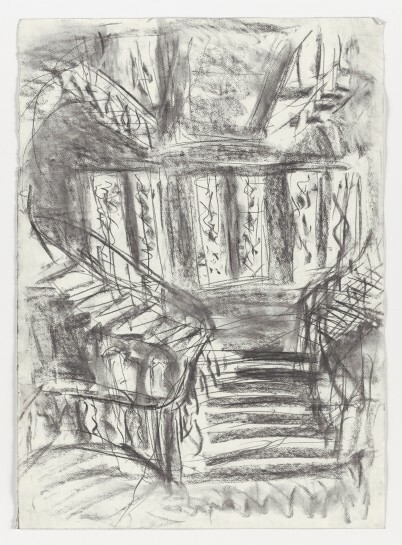 I am surprisingly moved by these drawings of an old, sweeping staircase. It is this very same sense of emotion that floods the back room of the fourth floor gallery. A room devoted purely to drawings of Arnold Circus in Shoreditch, the place of the artist’s boyhood; four walls of charcoal and pastel scenes of the same place from a few different angles, with red-brick buildings, airy trees, old-fashioned bandstand and another well-trodden staircase; the subject repeating and repeating, almost like a mantra. One half of the selection is lighter in hand, possibly more colourful. The hues have changed. I then find out, half of these drawings are dated 2008-2010, and the others are from a return to the area during the Olympic Summer of 2012. This change in execution lends itself brilliantly to the changes in the East End, on the lead up to the London Olympics, and indeed the changes of the area within the lifetime of an East End boy. The Arnold Circus drawings really are most poignant. They are light, they are colourful, they resonate with contentment; we know he loves that place. These are like portraits of a dear old friend. I feel like I have had a peek behind the curtain, at the artist who gave us his rigorously sculpted, lava-like paintings, and discovered a more sensitive man than I would have imagined. This is a show that reveals urban beauty. It reveals a passion for capturing the changes within city life, with such sensitivity and respect, like no other I have seen. I am enraptured by the work. I am excited by these drawings; the quickness of hand; the repeated exposition; and the changes in Kossoff’s treatment of his subject. I have been witness to the unfolding love story between our main protagonist and his passion for an ever-shifting city.